The proposed budget would maintain funding for Pell grants for needy college students, but would eliminate more than $700 million in Perkins loans for disadvantaged students. No attempt would be made to lessen the burden of escalating college costs for students, whether middle-income or poor. Student debt is currently about $1.4 trillion, and many students, whether they graduate or not, spend years, even decades, repaying their loans. These cuts will reduce the number of students who can afford to attend college. The most devastating cuts are aimed at programs for public schools. Nearly two dozen programs are supposed to be eliminated, on the grounds that they have “achieved their original purpose, duplicate other programs, are narrowly focused, or are unable to demonstrate effectiveness.” In many cases, the budget document says that these programs should be funded by someone else—not the US Department of Education, but “federal, state, local and private funds.” These programs include after-school and summer programs that currently serve nearly two million students, and which keep children safe and engaged in sports, arts, clubs, and academic studies when they are out of school. They have never been judged by test scores, but the budget claims they do not improve student achievement, and aims to save the government $1 billion by ending support for them. The budget assumes that someone else will pick up the tab, but most states have cut their education budgets since the 2008 recession. No mention is made of how other sources will be able to come up with this funding. The administration wants to end many programs that are aimed at the poorest students and disadvantaged minorities in particular, while canceling vital enhancements to public school education like arts and foreign-language funding. These include supplementary educational services for Alaskan Native and Native Hawaiian students ($66 million); arts education ($27 million); American history and civics academies ($1.8 million); full-service community schools that provide comprehensive academic, social, and health services to students and their families ($10 million); library-based literacy programs ($27 million); “impact aid” to districts that lose revenue because of federal facilities like military bases ($66 million); international education and foreign language studies ($73 million); the Javits program for gifted and talented students ($12 million); preschool development grants to help states build or expand high-quality preschool services ($250 million); Special Olympics programs for students with disabilities ($10 million); and Supporting Effective Instruction State Grants, funds used to train teachers and to reduce class sizes ($2.345 billion). In addition, the Trump-DeVos budget would eliminate funding for a potpourri of programs including mental health services, anti-bullying initiatives, and Advanced Placement courses ($400 million). This is only a sample of the broad sweep of programs that would be eliminated, not just reduced. Some of the programs, like the Special Olympics for handicapped students, are small grants but they have both real and symbolic importance. The cuts to funds for reducing class sizes will have an immediate negative effect. With billions cut from existing education programs, the only area of increase in the education budget would be grants for school choice. The department’s Title I program consists of billions of dollars distributed to states and districts to aid in the education of poor children, by providing smaller classes, extra aides in the classroom, or other assistance. Trump would set aside $1 billion of Title I funding as a reward for states that create open enrollment policies, which allow parents to choose schools that are not their neighborhood schools, and that allow federal, state, and local dollars to follow students to the public school of their choice. In “reform” circles, this is known as the “backpack-full-of-cash” method of financing school. The money goes wherever the student goes. 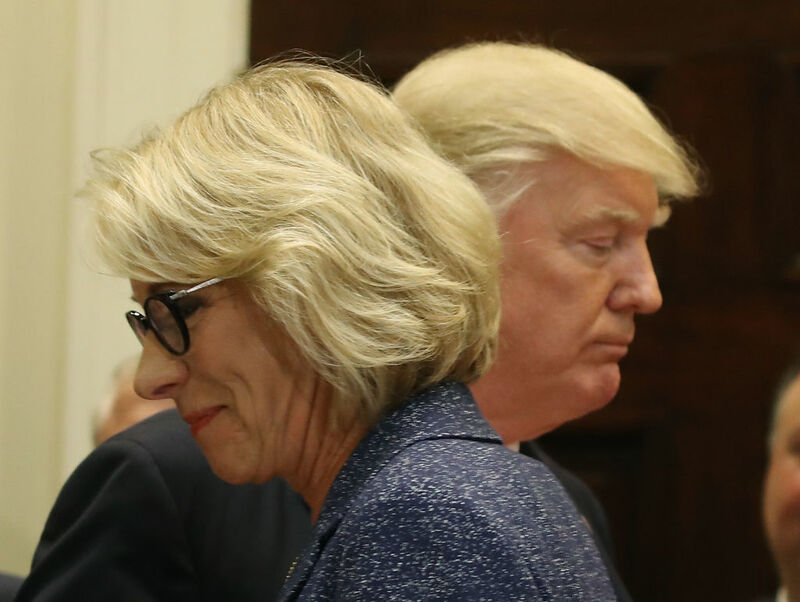 The other Trump-DeVos initiative is $400 million to “create, develop, implement, replicate, or take to scale entrepreneurial, evidence-based, field-initiated innovations to improve student achievement…and rigorously evaluate such innovations.” This murky statement is aimed at setting aside funds to underwrite vouchers that could be used at private and religious schools, as well as research on the effectiveness of these programs. Ironically, the Trump administration is modeling some of its approach on the Obama administration’s Race to the Top program, which held a contest for states in 2009 and 2010. According to Race to the Top, to be eligible to compete for $4.35 billion in federal funds, states had to agree to increase the number of charter schools in the state; to evaluate teachers by the test scores of their students; to adopt “college and career ready standards,” which everyone knew were the freshly-minted Common Core standards (never field-tested); and to agree to take dramatic action to restructure or close schools with persistently low test scores. There was no evidence of effectiveness to support any of these policies, but most states changed their laws so they could compete for badly needed funding. A recent evaluation by the Department of Education found that these policies were ineffective: “Overall, across all grades, we found…no significant impacts on math or reading test scores, high school graduation, or college enrollment.” But nonetheless the Race was a successful way to lure states into doing “voluntarily” what the federal government wanted them to do but was prohibited by law from ordering them to do. Similarly, Trump is offering states a chance to win a slice of the $1 billion Title I pot if they agree to meet his and DeVos’s demand for more school choice: more charters, more vouchers, more online schools, more alternatives to public schools. Although they are not offering as much money as Race to the Top, nearly two thirds of the states are now in Republican hands, and most are likely to jump at the chance to introduce school choice and vouchers for religious schools. Since the enactment of George W. Bush’s No Child Left Behind, it has become customary for every piece of federal education legislation to insist upon “evidence-based policies,” and then to in fact impose policies based on speculation, without any evidence behind them. NCLB made reference to “evidence-based” over one hundred times. NCLB required every public school in the nation to test every child in grades 3-8 every year, and to punish or reward schools based on their test scores, although evidence was lacking for this bold federal intrusion. The “Texas Miracle” was supposed to be the evidence for this strategy; Bush said that if you test everyone every year, scores go up, graduation rates go up, and the achievement gap among the races begins to close. Unfortunately, this was not supported by the actual results; there was no miracle, just—as we say in Texas—“Texas brags,” an empty boast. And now the Trump administration says it wants school choice policies that are “evidence-based…to improve student achievement.” But we have had charter schools and voucher programs since 1990, and there is a growing body of data showing that they do not improve student achievement. Milwaukee opened charter schools and a voucher program for poor children in 1990. It now has three competing sectors: public schools, charter schools, and voucher schools. The latter two sectors get to choose their students and prefer to avoid students with profound disabilities or who are in the process of learning English. The public schools are required to take all comers. Nonetheless, there is little if any difference in test results among the three sectors. And Milwaukee is one of the lowest performing urban districts in the nation on the federal tests called the National Assessment of Educational Progress. No rising tide there. There are voucher programs in several states, such as Louisiana, Ohio, and Indiana. Recent evaluations have found that voucher students in those states did not perform as well academically as their peers in the public schools. Earlier this year, a federally funded evaluation of the voucher program in the District of Columbia, established by a Republican–led Congress in 2004, found that, on average, students who used the voucher had worse test scores than their peers who remained in public schools. DeVos, who has spent decades advocating for school vouchers, responded to the poor results by saying: “When school choice policies are fully implemented, there should not be differences in achievement among the various types of schools.” But if the goal is to “improve student achievement,” this seems an admission of failure. DeVos’s home state of Michigan embraced the choice ideology, but not vouchers, because the public overwhelmingly rejected them in a referendum in 2000 (funded by DeVos and her husband). Michigan has hundreds of charter schools. Eighty percent of them operate for profit. Charter schools perform worse on state tests than public schools. Over the past fifteen years, as Michigan pursued choice as its reform strategy, the state scores on the National Assessment of Educational Progress dropped significantly. Thus, we have a budget for federal education policy that swings a mighty scythe, mostly at programs that serve middle-income and low-income students. Its major innovation is a proven failure. DeVos has no ideas about helping or improving public schools. Her only idea is choice. But we already know how that will turn out.